Aspiring guitarist will I’m sure get even more out of it and be able to sympathise with every moment of finger pain. How often you might want to re-read the book I’m not sure, but Michael has thought of that and has published this as a very reasonably priced ePub format, so you download it to your favourite device and take it from there. It worked fine on my MacBook. My other thought on having read the book is what a great indie movie there is to be had out of the project. It sounds mad, but you’ll maybe see what I mean if you have a read. Kickstarter here we come. As a guitar player I used to slow records down etc. to see if they reveal more of how it’s done (didn’t work for me). I’d drive myself bananas sometimes trying to get something off. I’ve learnt to leave things alone if I wasn’t getting anywhere following the law of diminishing returns plus it’s not important to duplicate someone else’s efforts to the letter. It’s very useful learning from other players and enjoying their work but moreover it’s about me enjoying playing! I believe Ritchie B noted his switch to Stratocaster was with the aim of achieving an original sound. Don’t get the obsession with this or indeed the general desire to analyse Ritchie’s playing. The man himself can’t stand that approach to guitar playing. Half the time he doesn’t even know what he is playing as Jon pointed out on the Machine Head documentary. Music is an expression and once you have taken that feeling out of it and are merely trying to replicate note for note what someone else created it becomes pointless. I once saw a Purple tribute band who had rehearsed tracks from Made in Japan exactly how they were played on that one performance only! Replicating improvisation! Absurd! 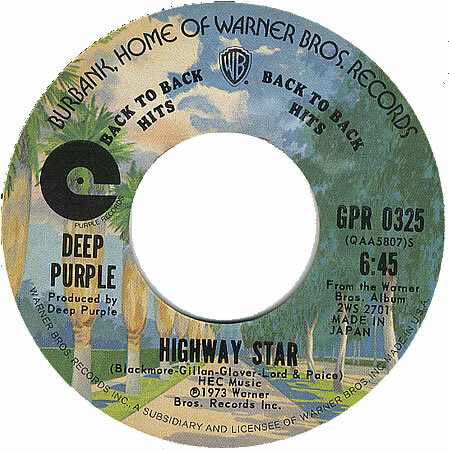 Although I accept Highway Star was one of the few worked out solos he repeated no one will ever play it as well as he does so why bother? If he’s been playing 22 years why’d it did him a further two years of playing everyday to reach his goal? It’s a difficult solo because it is so precise (even more so if played so clean like Ritchie) but two years?